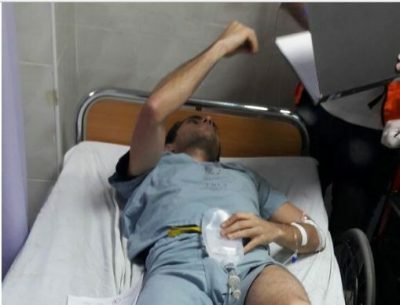 Canadians for Justice and Peace in the Middle East (CJPME) condemns Israel’s shooting of London, ON based doctor Tarek Loubani, shot while attending the wounded in Gaza. Despite being clearly identified as a first responder, Loubani sustained a moderate injury to his left leg, and a minor injury to his right leg. A friend and colleague of Loubani’s, paramedic Musa Abuhassanin was killed, along with at least 54 other Palestinians in Gaza yesterday. He also called for an independent investigation of the Palestinian deaths. “We demand that our government condemn the shooting of Loubani, if not the killing of the 55 other Palestinians,” declared Thomas Woodley, President of CJPME. “While the shooting of Palestinians civilians is unlawful, the shooting of medical personnel is even more egregious,” continued Woodley. Many pundits pointed out the incongruity between the killings in Gaza, and the nearby fanfare of the inauguration of the new US embassy in Jerusalem. Current events suggest that CJPME was correct in disagreeing with US president Trump’s assertion that the move of the embassy was a step toward peace.